Skotte often goes to gaming conventions. Over the course of a few days, he might play something like thirty games, some of which the world has never seen before. It’s very exciting stuff! After one convention, I received the cutest gift from him – a tiny Doctor Who! I had to talk myself out of wanting one of every character the company makes! They are so cute! 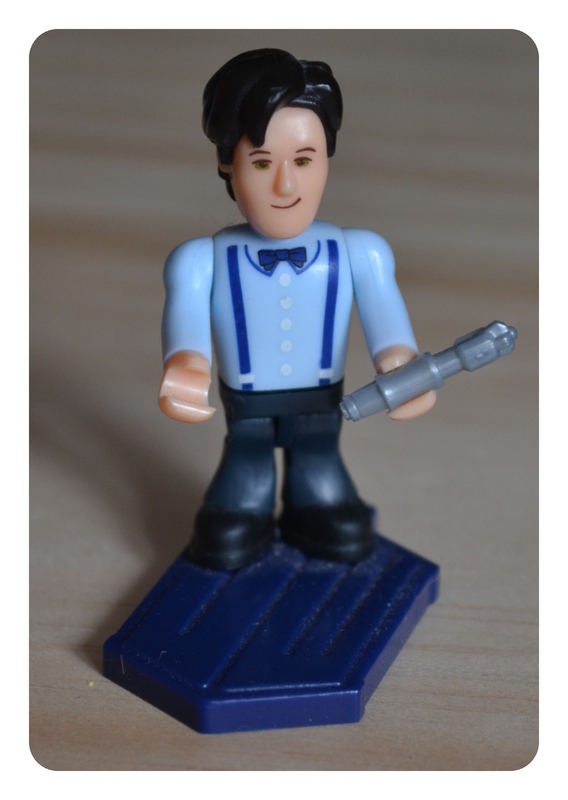 No, I will be content and deliriously happy with my one tiny Doctor. Tiny Doctor resides on my desk, amongst other fun characters. There’s the fiddle playing gnome, Hello, Kitty! on a keychain connected to my WoW authenticator, a mini Wegmans truck (Wegmans is our totally awesome local grocery chain), and my Autumn Bear from some good friends. There is something missing though…!!! I have Sandman figures which I received for Christmas one year from Skotte. They are all sitting in their original packaging, because that makes them more valuable for the future. But are they really serving me in this capacity? I go back and forth on this issue. Obviously, once opened, you can’t really turn back time to un-open them. (Although, maybe my tiny Doctor could help now!) The Endless and their Dreaming counterparts sit patiently in the meantime, wrapped in plastic. There was a Judge John Hodgman court case about this. (Listen here.) A woman wanted to open her Scully figure, while her husband wanted to keep his Mulder and her Scully in their packaging to retain the value. I won’t tell you how Judge Hodgman ruled, but it’s a rousing case, and worth listening to! So I ask: What would you do? This entry was tagged conventions, doctor who, judge john hodgman, mulder, poll, sandman, scully, to open or not to open. Bookmark the permalink. ← Why I Do What I Love – Happy Valentine’s Day!